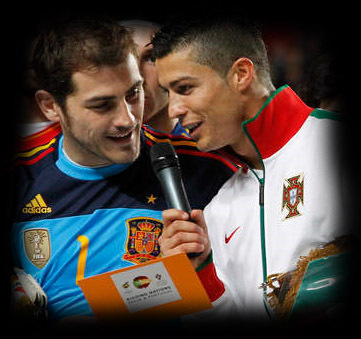 18.12.2010 »» José Mourinho and Casillas: "Rumours are completely nonsense"
Last night, Iker Casillas decided it was time to say something about the rumours (Read full story about this here) and he was very clear about the potential conflict with Ronaldo: "There are spanish newspapers that just wants to create controversy and bad atmosphere, when it's completly the opposite." José Mourinho also talked about this topic in the day prior to facing Sevilla at the Bernabeu. Mourinho said: "Rumours concerning Cristiano and Casillas relationship are made up in order to sell newspapers when there are no real interesting news. Some news that are made up, such as false signings, are much less detrimental to the image of players. That's all it is. There are no problems on my squad. We don't want to play this game, but I do have to say me have no internal strife whatsoever." Regarding the match, Mourinho then added: "The match against Sevilla is worth three points regardless of absences on either team. Both sides want to win for different reasons. Our fans must always make a difference and they are always there for us at home. The two games we have yet to play before the new year are important. If I may, I'd like to ask the fans to come to the stadium. We will give our all in both games and they will help us win with their support."